Callaway’s latest driver introduces Jailbreak technology that should add some speed off the face. Jailbreak technology. Sounds evil. Sounds non-conforming. Well, Callaway has been working on the new technology for some time now and were able to get their newest driver, the Great Big Bertha Epic, on the USGA’s conforming list. With the promise of extra ball speed off the face of the club, the Epic ma be the most anticipated driver of 2017. It certainly created a lot of buzz in December and early January. Does the Epic deliver on its promise? Just how much does Jailbreak technology boost your distance? Read on to find out. As mentioned, the main technology innovation in the Epic driver is what Callaway refers to as “Jailbreak” technology. At impact, the face of the driver deforms and pushes up and back on the crown, and down and back on the sole. This bulging results is a loss of energy in the clubface. To conserve energy, Callaway has inserted two 3G Titanium bars to create a strong bond between the crown and the sole to keep the bulging to a minimum. This transfers energy to the ball rather than into the crown or sole. More energy into the ball equals more ball speed, or so that is what they are marketing. This technology isn’t visible on the crown, where they’ve hidden the connecting points, but on the sole it’s visible in the form of two circles – the ends of each of the “bars” or rods comprising the “jail” cell. The Jailbreak technology behind the face of the Epic. Though Jailbreak is the headline feature of the Epic, Callaway didn’t stop with the technological improvements there. Since they’ve added the Jailbreak rods, they had to save the weight somewhere, so Callaway designed the crown with a single carbon-composite crown weighing only 9.7 grams. The Epic crown is 30 percent thinner than crowns Callaway had used previously and over 60 percent lighter than the titanium crown used in last years’ XR16 driver. Carbon is also found in the sole of the club to remove weight from the middle of the club. These changes not only save the necessary weight, but also lower the center of gravity. With the triaxial carbon construction Callaway paired a lightweight but strong titanium Exo-Cage. This combination is designed to provide maximum forgiveness while saving precious weight. The designers used this discretionary weight in the 17-gram adjustable weight in the back of the club. you can slide this weight to help adjust for a fade or draw bias. 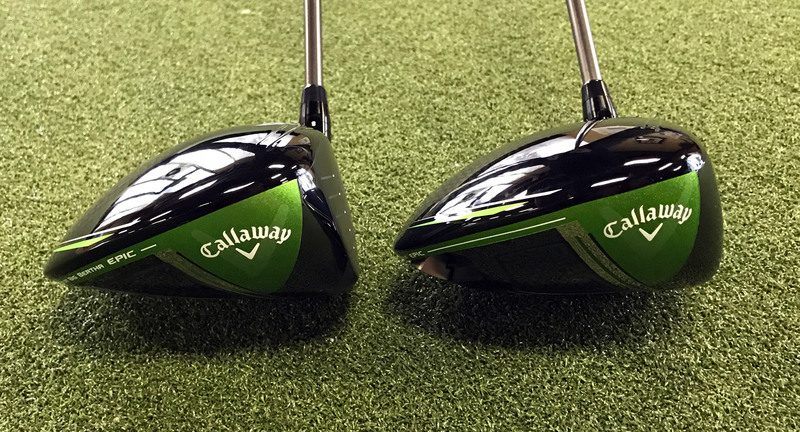 Callaway has claimed that this weight can help a golfer change about 450 rpm of sidespin or 21 yards of directional difference. 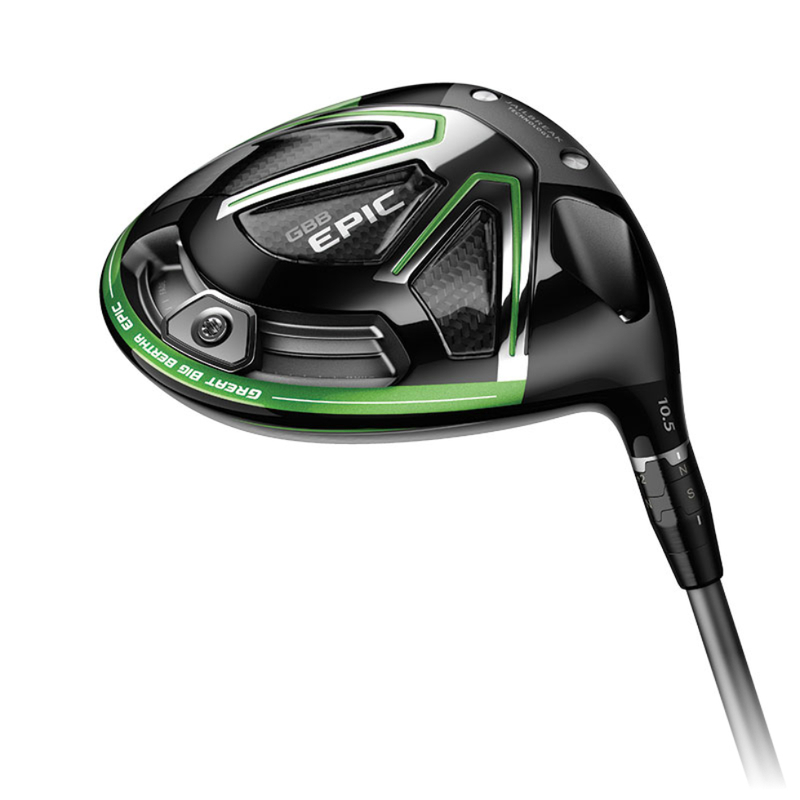 The adjustability of the Epic is same as it was for their previous drivers. The 9-degree driver we tested can be moved anywhere to have 8 to 11 degrees of loft in one-degree increments. My old Callaway wrench from a few years back works just fine to adjust the new Epic. I’ve always like the look of Callaway drivers. The Epic is another solid looking club. On the top of the club, you can see the carbon-composite crown with its weave pattern. The shiny, gloss finish is a bit of a divergence from the XHot drivers I’ve owned over the past few years but I love the esthetics. The traditional Callaway logo alignment also adorns the top. It’s raised slightly, providing a bit of aerodynamic benefit, and a nice look at address. You can see the carbon composite technology at address. The face of the club has a very similar design to the XHot drivers with the stylized “X” embossed into the face. Other than what’s hidden behind the face (see: Jailbreak Technology) there isn’t much else to talk about. The sole of the club is where things get interesting. 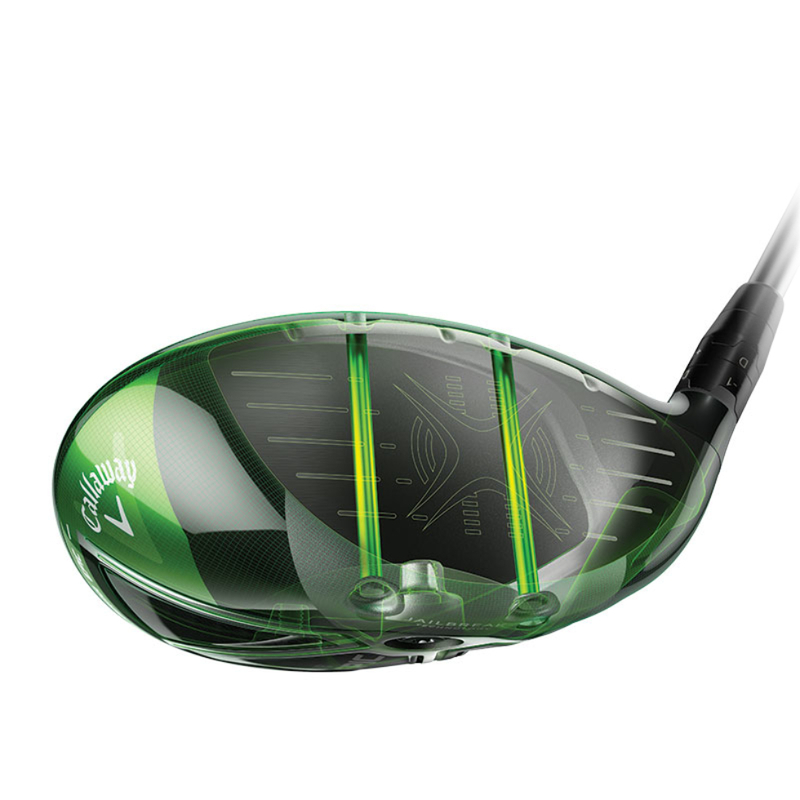 First, lets talk about the color scheme that Callaway picked for this club. A slightly darker tint of lime-green. I would say that I’m not the biggest fan of green, but I digress. I might have preferred keeping the red but this is a different club all together so I understand the need to re-brand and market it differently. Callaway kept a similar feel to the sole of the Epic as the GBB 816. The shape of the lines mimic that, somewhat, of their logo with a nice mix of metal and (again) the carbon composite materials. I do like the look quite a bit. I’d describe it as slightly industrial. When you have so much technology I guess that’s not a bad thing. The other major thing you will notice on the sole of the club are the ends of the two titanium bars that comprise the Jailbreak technology. Callaway even added a nice text between them to remind us of just that. Overall I quite like the look of the club. I’ve read that some others prefer a much cleaner, less busy look to the crown of the club. I can understand their complaints but this doesn’t detract in my opinion. The biggest change (for me) is going back to a glossy finish on the crown from a matte finish. I have no problems with this and I think Callaway has done a very good job in the design of the Epic. The only disappointing thing about receiving the Epic in early January was when I looked outside and saw a few inches of snow on the ground here in North Carolina! Thankfully it melted quickly and I was able to get out on the range, on a launch monitor, and also onto the course with the Epic over the span of a couple weeks. I was very pleased with the results in many different aspects. First off, let me talk about the sound. I’ve gotten used to a much higher toned sound from my current driver. In the past year I’ve noticed a few people with other drivers that have a much more solid and less ear-piercing sounds. The Epic, like those other drivers, has a much more muted, softer sound with a very slight ring. It sounds exactly what you would think a solid piece of metal should sound like rather than an empty chamber of metal. Perhaps, more “carbon” and less “titanium” sounding. Very, very pleasing. I love the sound coming off the face of the Callaway GBB Epic. The weight and feel of the club has a good overall balance. I’ve always felt like my XHot was a bit heavy in the clubhead. I’ve picked up some other drivers that felt a bit too light. The Epic is right in the middle. Now, yes, the shaft has something to do with that (and I did get a slightly heavier shaft), but after just a few practice swings it felt good in my hands. At setup, I didn’t notice that it wanted to bias itself open or closed. Another good sign. 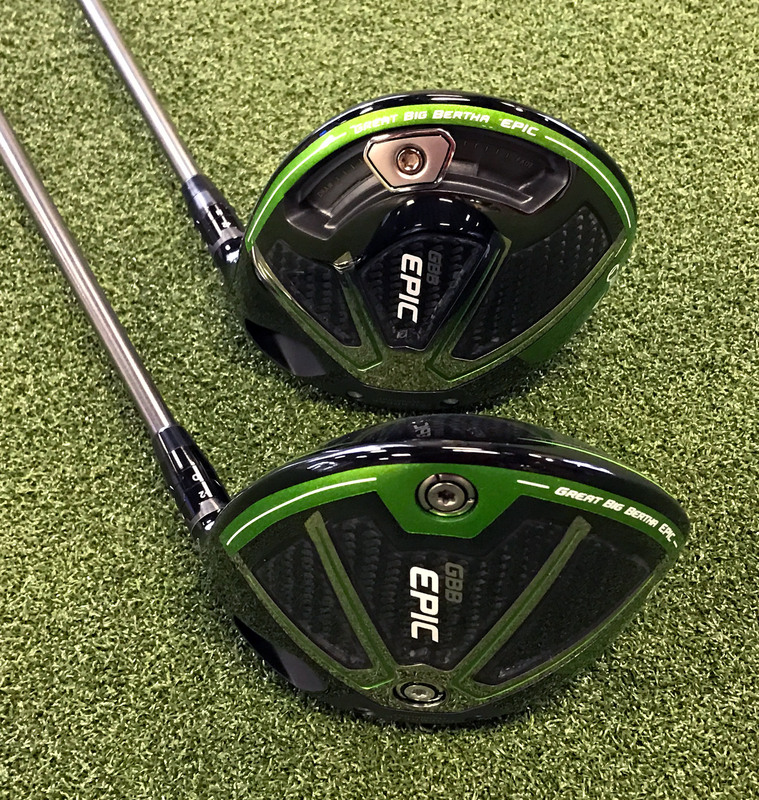 The first swings I took with the Epic were at the range where I could compare it side-by-side with my current driver. I set the Epic at neutral and 10 degrees, the same as my XHot. The first thing I noticed is that the ball came out consistently lower and seemed to spin less with the Epic. So much that I moved it to 11 degrees. Once I had it set there my launch angle was nearly identical to my XHot but the spin still seemed to be lower. Not a bad thing since I’ve felt my XHot was spinning a bit too much. I couldn’t discern too much difference in carry distance on the range but the Epic definitely had a better ballflight. It might have been carrying a few yards more but, as I mentioned before, the lower-spin would give me a few extra yards of roll. I wanted to get to a launch monitor to see exactly what those differences were. More on that later. Even off the toe the Epic performed great. As for off-center hits, I would say the Epic did quite well. In the run-up to today’s launch in retail stores, we’ve heard of people increasing ball speed 4-5 MPH over their current driver, and I wondered how that was possible given the CoR rules and other regulations. Well, it turns out that most people don’t hit the sweet spot every time, so if you miss by a little, you give up a fair amount of ball speed. Much of that loss is gained back with the Epic and the Jailbreak technology. For example, I hit a few thin balls that seemed to carry a bit more than I would have expected. Slightly off the toe a could other shots were hard to distinguish from center-of-the-face swings. My old driver was quite forgiving but I was pleased with the Epic. After those couple of range sessions I was able to head to a local store where they kindly let me bring the Epic and my XHot 2 and hit the TaylorMade M2. I was looking specifically for two things. First I wanted to see if the ball speed off of the Epic was higher than the other drivers and, two, I had to see what the spin rates were. My hunch was the Epic was spinning it much less than the XHot was. After warmups I alternated and hit a number of balls with each driver. I tossed one bad drive from the XHot and one from the M2. I didn’t toss any drives from the Epic. Below is are tables of those results (click any image for a larger version). The first thing that jumps out are the spin rates. The Epic is spinning about 300 RPM less than my current driver. 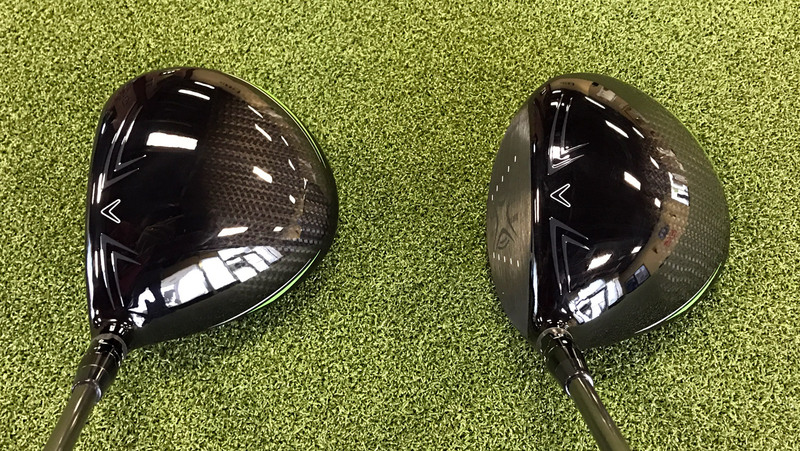 The TaylorMade M2 is right between the two. I’m also carrying the ball further with the Epic and getting more roll with those lower spin rates even though I’ve set the Epic at 11 degrees and the XHot at 10. This is where getting on a launch monitor to see the numbers really helps you tweak and dial in your settings and fit. As for ball speed, there isn’t a sizeable difference but the Epic was slightly faster off the face than the other drivers. I have to admit that I had a good session and was nutting most of the drives, with centered contact, and given the rules and regulations I shouldn’t expect to see much more than the theoretical ball speeds from impact there. So, while I was expecting something more on the order of a 3% increase, the 1% increase may be explained by the good contact. As my range session seemed to indicate, I’d see more ball speed on mis-hits, but I couldn’t test that on the launch monitor. I’m a decent golfer, but I’m not a robot! What did surprise me were my carry and total distances were significantly higher! The ball speed is not significant, but the lower spin numbers and launch angle seem to be in a perfect sweet spot for me. What I thought was a slight gain on the range turned out to be five yards of carry and nine yards of total distance – that’s notworthy. Once I was finally able to get the Epic onto the golf course it only confirmed what I was seeing on the range and the launch monitor. Probably the biggest thing that I noticed was that the club seemed more forgiving. Off-center hits still jumped off the face. In colder, wet conditions I didn’t hit a single disappointing drive that left me unhappy. In fact, given those conditions, I was surprised at how far a few went. Once the summer comes, I’m excited to see how the Epic performs. One thing I did not test was moving the adjustable perimeter weight. I normally play a draw on all of my clubs and leaving the weight in the center is the best way for me to accurately judge the club against my existing driver or other drivers. It’s something I may play with after this review. 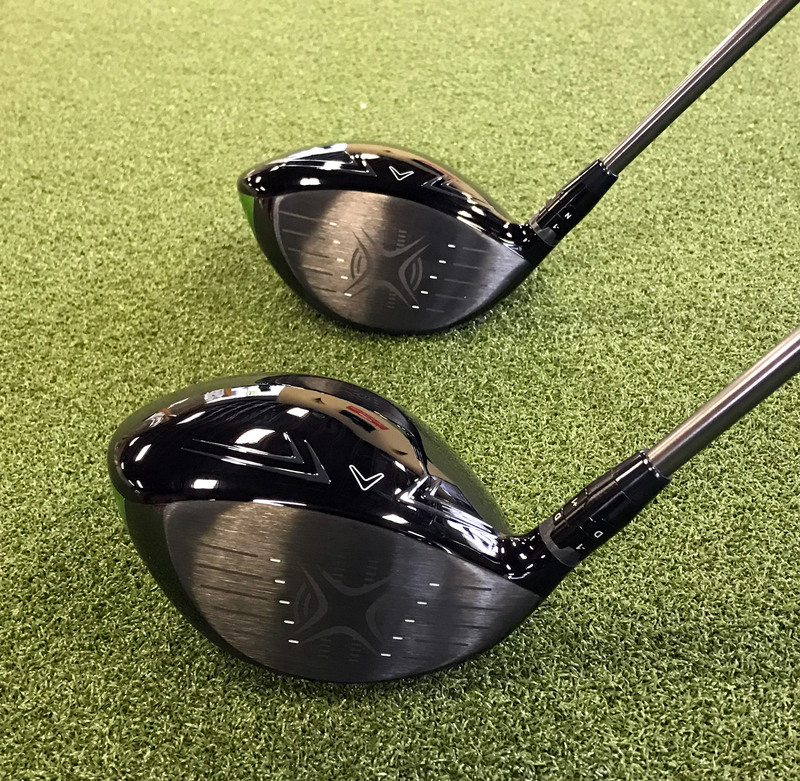 In addition to my testing of the standard model, TST owner Erik J. Barzeski tested the Sub-Zero version, with an X-flex 70g shaft and the driver set to 10°. 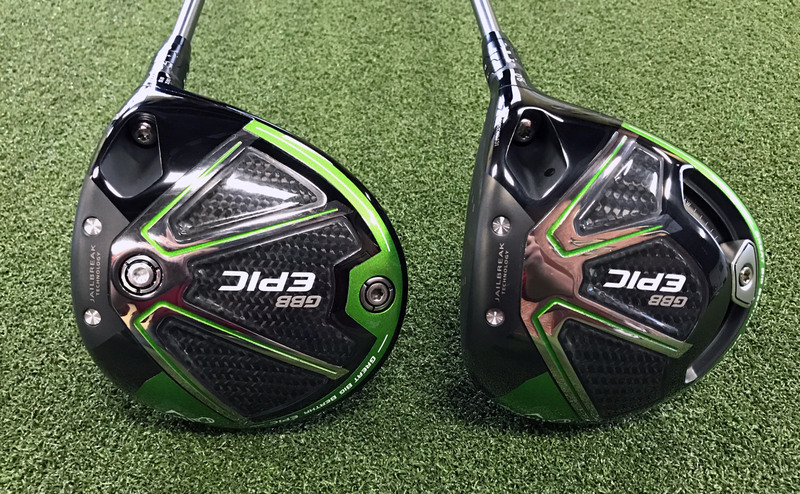 Erik tested the Epic against his Callaway GBB 816 Alpha Double Black Diamond (say that five times and it’s almost time for dinner) as well as some other recent drivers. In launch monitor testing, the Epic delivered nearly 3 MPH more ball speed, with very little change (as expected) on centered contact and up to 4.8 MPH on balls mis-hit about 1/4″ to 1/2″ off the center of the face. 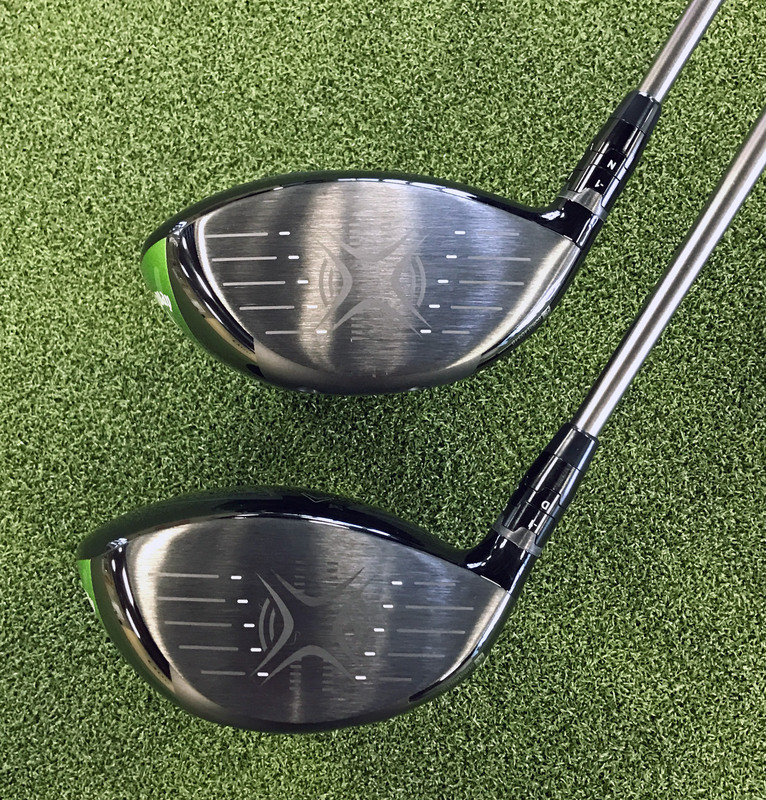 Like the 816 Alpha DBD, the spin stayed low even as the static loft was set to 10° In on-course testing, even into the wind, this driver delivers a high yet penetrating flight due to the low spin delivered. The sound, as Dave said, is pleasant and solid. you can get the Epic in 9 degrees or 10.5 degrees. Both are adjustable between -1° and +2°. For example the 9 degree model we tested can range from 8-11 degrees. There are numerous shaft options. The standard shafts are either Mitsubishi Diamana, Project X HZRDUS, Fujikura Pro Green or Aldila Rogue Max. For this review I had a 65g stiff Aldila Rogue Max. The Rogue Max shafts tested with the Epics. The head cover that comes with the Epic is very basic and standard. The look is fine but it feels a bit loose and flimsy even when it’s on the driver. Current retail for the Epic is at $499. Overall, I really like the Epic. It’s all about finding something that fits you both from a numbers/launch perspective and from an esthetic one as well. Walking out of the launch monitor bay I was happy to find a driver that seemed to not only fit my swing, but which felt great and sounded even better. I’ve had multiple Callaway drivers in the past handful of years and always been happy with them. As for everyone else I think that this club is well worth a look, especially if you don’t always find the center of the face. The Jailbreak technology seems to really help keep up ball speed. In my experience, once I adjusted the Epic for a lower launch I was more than happy to have it in my bag. I would suggest you get to a retailer and fitter to see if the Great Big Bertha Epic works for you as well. Solid review. It’s quite amazing how the bar continues to get raised, even if only by increments. The Epic seems like it’s worth a look. The Callaway Epic Driver is probably one of the best drivers out there. Great and informative article, thanks ! Well written review. I bought the Epic 10.5 a month ago, took my time. Installed my Grand Bassara 45g. On the first hole, I put down 3 balls and all were center and I know this hole. I only had 85 yards in, meaning I’d hit all three from 285-295. Must be good roll because that’s about 35 yds longer than any drive in years. I guess the golf gods were tempting me and parts of my swing were working, and the ground was hard. When reality set in, taking lessons every 2 weeks, things cooled off, but I was still hitting it 250+ while changing up shafts – I should not do that – it was my swing in transition. Feel is solid, and yes, muted, probably due to the Jail Break. Ball seems like it rockets off the face – feels as if the head has no give, and that is the purpose of Jail Break. Being a new player (in my third year) I couldn’t justify buying an Epic until now when I could get one used. I had been playing in xr16 which was an excellent Club compared to others that I had played, but I was really struggling with distance with anything but perfect ball strikes. once I got the club, I broke out my Mevo mini launch monitor which allows me to compare the basic stats. I was particularly interested in smash factor, as I struggle to consisistently hit the sweet spot. While no club will save me from horrible strikes, the Epic yielded immediate improvement over the XR16 on average. And on the course, I out drove my partner by a good 10-15 yards on every hole. Normally, we’re evenly matched, so this was really encouraging! I can’t even attribute the longer drives to roll because conditions were wet and the ball basically stopped where it landed. So count me in as a believer. The XR16 is going to be retired.